If you had asked me this 6 years ago i would have said Hooters. Extra sharp cheddar cheese melted between two thick greasy slabs of texas toast. Whew. artery clogging and delicious. But now? I would have to say the Breslin makes a mighty fine grilled cheese. They use a combination of cheeses for a sharp melty bite on a crusty bread with micro greens. its delicious. And if you ever need an eater... ::raises both hands:: pick me! pick me! OK - I would like each and every one of these!! I would LOVE to try the pecorino one b/c pecorino is my fav. cheese! :) Sarah - the only sandwich you're missing is a grilled jesus!! Glee reference anyone? Destination Soups in New Bedford, MA. Three different cheeses on thick sourdough bread; I like to dip the sandwich into their creamy tomato basil soup. I've got to get to Destination Soups! New Bedford is my old hunting ground!! I'm sooooo mad i didnt know about a GRILLED CHEESE event....unreal. My fave food ever. 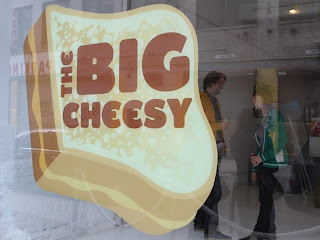 There used to be a grilled cheese restaurant in the city...forgot the name. They only served grilled cheeses! I am mad I missed this!